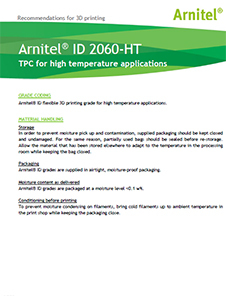 Arnitel® ID2060-HT by DSM is a 100% recyclable thermoplastic copolyester (TPC) grade for flexible 3D printing using fused filament fabrication (FFF). Arnitel® ID2060-HT offers unique balance of flexibility, chemical resistance against exhaust gas recirculation (EGR) condensate and prolonged high temperature resistance. It is suitable for printing end-of-arm tooling components and tubes for home appliances.